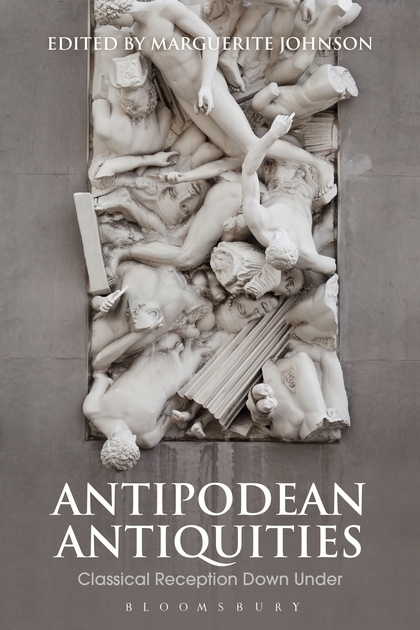 Antipodean Antiquities: Classical Reception Down Under, edited by Marguerite Johnson (Bloomsbury 2019). Leading and emerging, early career scholars in Classical Reception Studies come together in this volume to explore the under-represented area of the Australasian Classical Tradition. They interrogate the interactions between Mediterranean Antiquity and the antipodean worlds of New Zealand and Australia through the lenses of literature, film, theatre and fine art. Of interest to scholars across the globe who research the influence of antiquity on modern literature, film, theatre and fine art, this volume fills a decisive gap in the literature by bringing antipodean research into the spotlight. Following a contextual introduction to the field, the six parts of the volume explore the latest research on subjects that range from the Lord of the Rings and Xena: Warrior Princess franchises to important artists such as Sidney Nolan and local authors whose work offers opportunities for cross-cultural and interdisciplinary analysis with well-known Western authors and artists. We hope you can join us for the launch of Colonialism and Male Domestic Service across the Asia Pacific by Julia Martínez, Claire Lowrie, Frances Steel and Victoria Haskins (Bloomsbury 2019). The book will be launched by Professor Penny Russell at the University of Sydney on 18 February from 5 pm to 6 pm (Refectory Room H113). Light refreshments will be served. For more details and to RSVP please click here. Examining the role of Asian and indigenous male servants across the Asia Pacific from the late-19th century to the 1930s, this study shows how their ubiquitous presence in these purportedly 'humble' jobs gave them a degree of cultural influence that has been largely overlooked in the literature on labour mobility in the age of empire. With case studies from British Hong Kong, Singapore, Northern Australia, Fiji and British Columbia, French Indochina, the American Philippines and the Dutch East Indies, the book delves into the intimate and often conflicted relationships between European and American colonists and their servants. It explores the lives of 'houseboys', cooks and gardeners in the colonial home, considers the bell-boys and waiters in the grand colonial hotels, and follows the stewards and cabin-boys on steamships travelling across the Indian and Pacific Oceans. This broad conception of service allows Colonialism and Male Domestic Service to illuminate trans-colonial or cross-border influences through the mobility of servants and their employers. This path-breaking study is an important book for students and scholars of colonialism, labour history and the Asia Pacific region.